Dry to moderate moisture. Woods, forests. Full to partial sun. This is a 16″ to 32″ tall, erect, perennial forb that rises on a single stem, sometimes multiple stems, from a slender, cylindrical, rhizome. The rhizome is 12″ to 16″ long and 5 ⁄16″ to 9 ⁄16″ wide. It does not have the seal-like pattern seen on true Solomon’s seals, but it does have circular stem scars. It sometimes forms loose colonies. The stems are erect and arching, unbranched, and finely hairy, zigzagging slightly, with 7 to 12 leaves. The leaves are alternate, parallel to the ground, and on short leaf stalks, not clasping. They are elliptic to egg-shaped, 3½″ to 6¾″ long, and 2″ to 3″ wide. The leaf blade tapers at the base to the stalk and abruptly tapers to a long, tail-like appendage at the tip. The tail-like tip of the third leaf below the inflorescence is ½″ to 1″ long. There are usually 3 or sometimes 5 conspicuous, parallel veins. The upper surface is green and hairless with recessed veins. The lower surface is green with prominent (raised) veins and short hairs on the veins. The margins are untoothed. 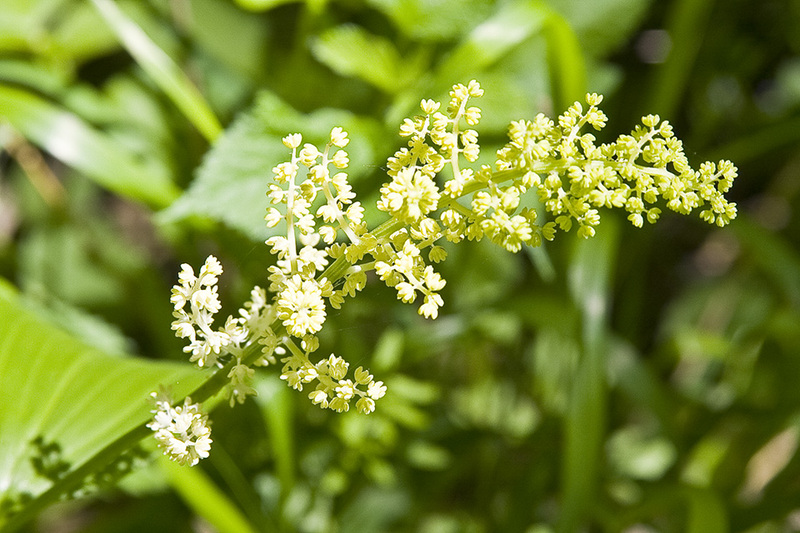 The inflorescence is a plume-like cluster of 20 to 80 tiny flowers at the end of the stem. It is 1″ to 4″ long and pryamid-shaped with well-developed branches. The flowers are star-shaped and 1 ⁄10″ to ⅛″ wide and long. There are 3 white, thin, inconspicuous petals, 3 similar sepals (6 tepals), and 6 spreading stamens. 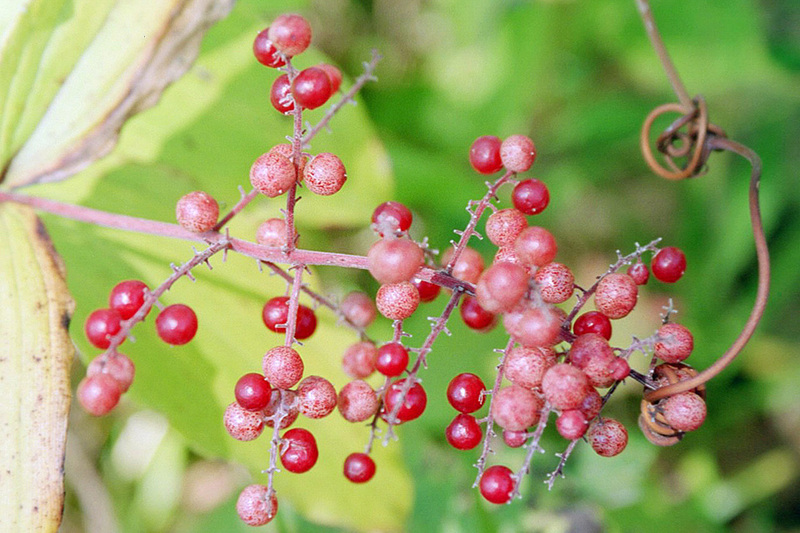 The fruit is a globular berry, ⅛″ to ¼″ wide, with 1 to 4 seeds. It is initially green with copper spots, becoming deep transluscent red when it ripens. 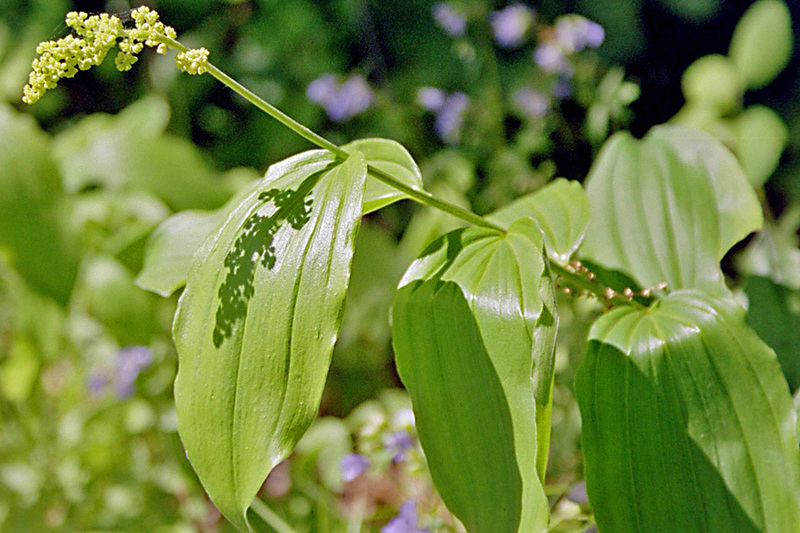 Smooth Solomon’s seal (Polygonatum biflorum var. commutatum) is a taller plant, reaching up to 48″ at maturity. The leaves are often clasping and have 7 to 19 parallel veins. The inflorescence is small clusters of cylinder-shaped flowers hanging downward from most leaf axils. 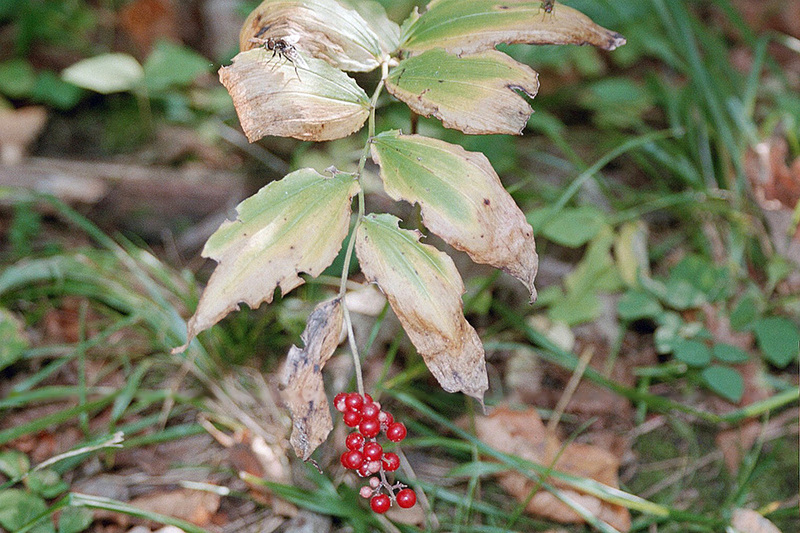 The fruits are green when young and dark blue-violet when mature. Starry false Solomon’s seal (Maianthemum stellatum) stems are more erect. 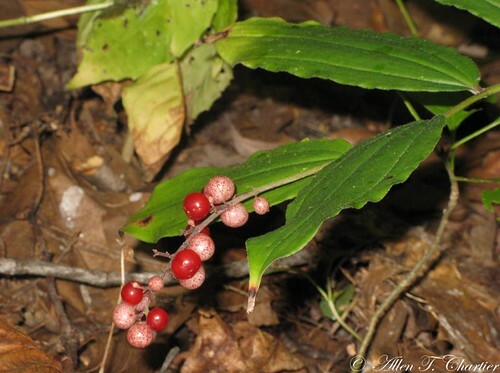 The leaves are narrower, lance-shaped, stiff, folded, and somewhat clasping. The inflorescence is an unbranched cluster of 6 to 15 flowers. The flowers are about ⅓″ wide. 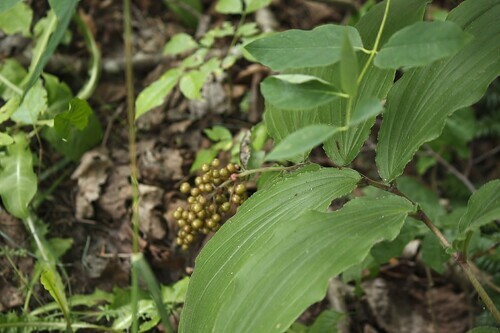 The fruits are larger and are yellowish-green when young with 3 to 6 red to purple stripes. Nearly exactly like Solomon's Seal, except the leaves are opposite. But I personally think the best indicator is where the berries are: False has berries at the end of the stalk (where the flowers are) and true has berries along the length of the stalk. 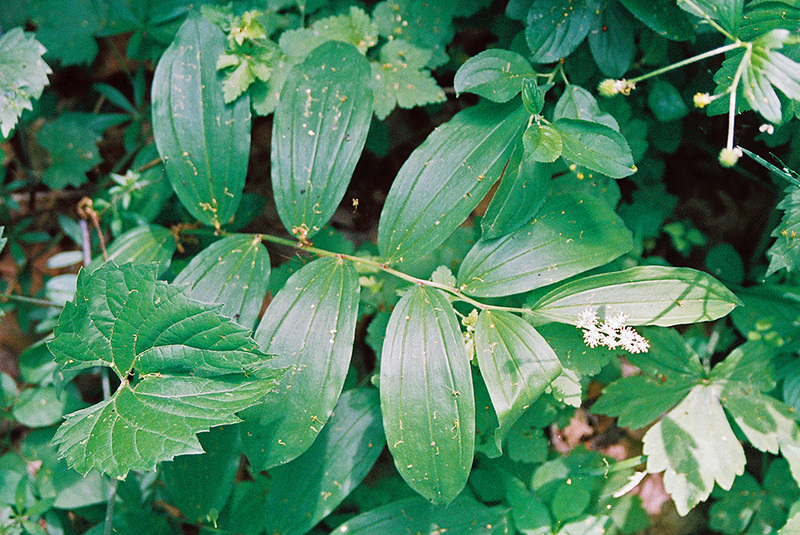 More Solomon's Seal showing flowers: http://youtu.be/yF2t2YUWIgw Polyonatum biflorum. These two plants are entirely unrelated belonging to completely different genera. But, they look quite similar until close inspection reveals the vast differences. 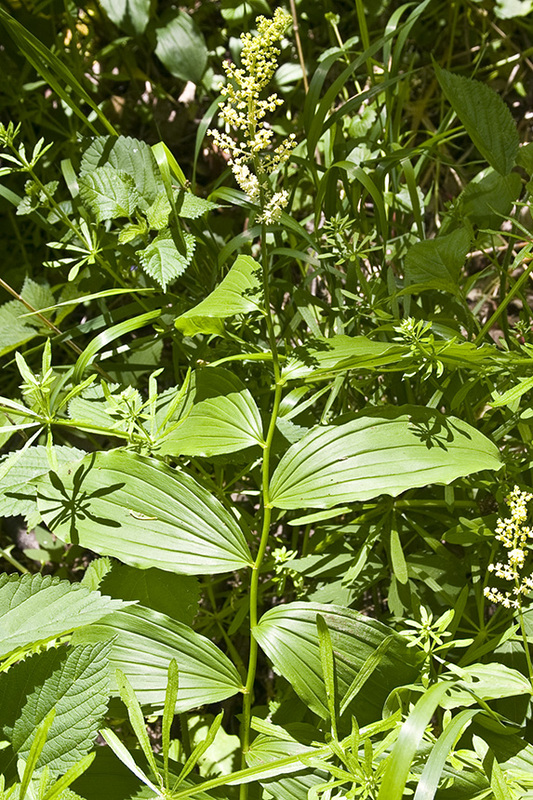 Both true and False Solomon's Seal are reported to have medicinal and edible qualities. 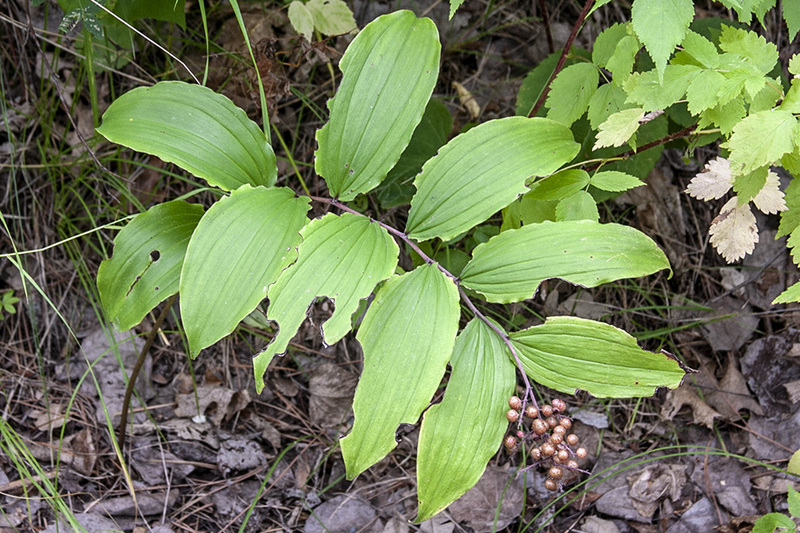 Solomon's Seal is quite rare locally, but False Solomon's Seal is fairly abundant. 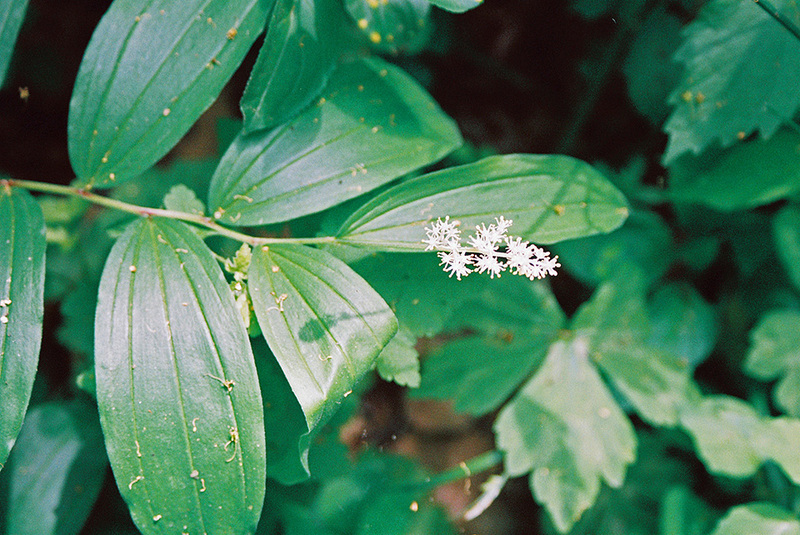 Native Americans reportedly used these two plants for both food and medicine. 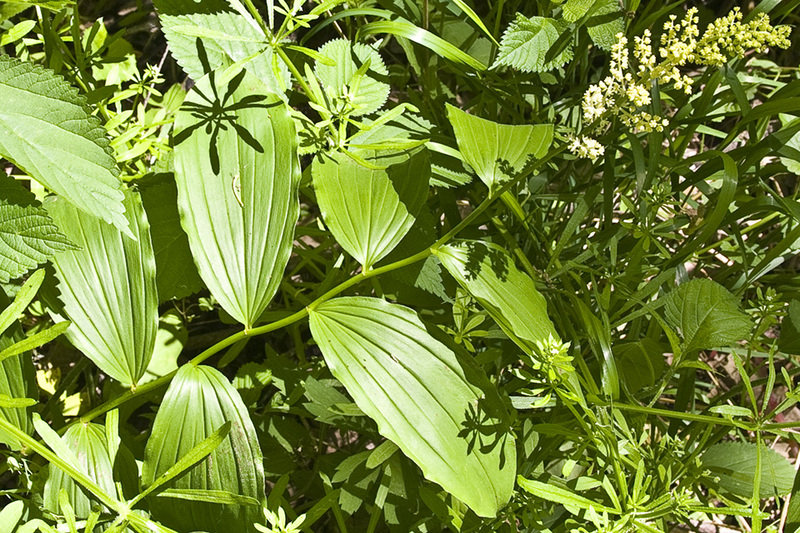 Modern herbalists still recommend Solomon's Seal, properly prepared, as an excellent relief for pain associated with joint, tendon, cartilage and back injuries. Tags: Plant comparison Solomon's seal false solomon's seal identification "edible and medicinal plants" eastern woodlands michigan polygonatum biflorum smilax ethical harvest protected species pickers flowers "edible roots" rhizome berry midwest "primitive skills and technology" survival bushcraft prepping morel ash woodsman forager neolithic native american ethnobotany herbal remedy medicine history health joint pain lubricating strains sprains tendonitis wrist elbow knee "natural back pain relief"
This video is giving a positive id on the plant False Solomon's Seal, it very closely resembles Solomon's Seal, but they are different, False Solomon;s Seal has a poisonous root and the berries while edible, if eaten in quantity will upset the stomach. The part you want to eat is the young spring shoots but because the shoots so closely resemble other poisonous plants such as jack in the pulpit, you need to go out now, id the plant and then next year go and pick the shoot, its not worth screwing it up. Since the videos say " if you dont know the plant then dont eat it " this will help us all to know the plant. Thank You.